The name Quebec City means “where the river narrows,” and if you can’t remember it now, you certainly will after a visit to the ski areas that surround the city. The two largest resorts nearby, Le Massif and Mont-Sainte-Anne, hug the river tighter than two lovers on a cold Quebec night. 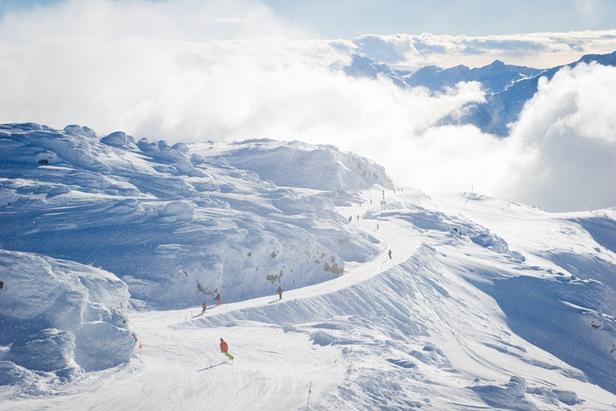 For you, this means incredible vistas providing views that incite deep breaths on the slopes. I’ll be quite honest: Half the challenge of the terrain is keeping your eyes on the snow and off the scenery above eye level—on a clear day, it’s that impressive. But it’s not all appearance. Quebec averages 248 inches of snow per year, and given the resorts’ close proximity to the city and its airport, a long weekend is all you need to experience it. One of the nice things about the region as compared to other ski regions is that you can use public transportation for the length of your trip. The co-founder of Cirque du Soleil purchased Le Massif in 2002 and financed a train in 2011 that now runs from Quebec City to Le Massif, as well as to his new hotel, La Ferme. The hotel is located just east of Le Massif, and you can either ride the train from the hotel or take a shuttle to the top of the mountain. That’s right—the main lodge, parking and drop-off are at the top. It sure is nice to arrive and get right to skiing. The terrain is steep for the most part on Le Massif, an asset that helps to show off the views and make you feel like you’re skiing down into the St. Lawrence. 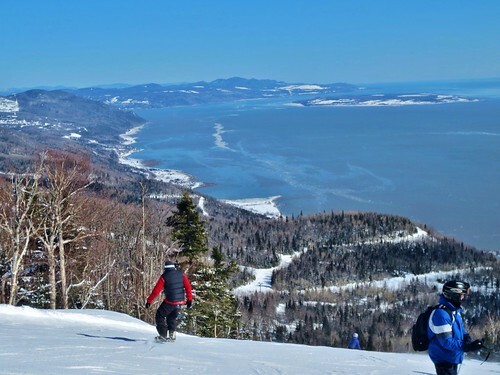 Take to the southern side of the face for ridiculous views to the north and a half-dozen or so solid black-diamond rippers, one of which being the La Charlevoix raceway. Use the Maillard Express lift to avoid long lines that can build up at the gondola on weekends. Be sure to wake up the legs and take in the scenery, because you’ll need to keep your head down when you roll over to the Secteur Hors-Piste, or the off-piste section on the north side of the mountain. There are no official runs in this area—it is here that you’ll find all the tree runs you can handle, some of them very steep (and still with a view). The combination of the challenging terrain, green pine trees and blue waters below put a big grin on my face. More adventurous skiers and boarders can hike up even further on the mountain if they so choose. Ski patrol at Le Massif recommends you go with a group of at least two or three people, although it is not required and you are technically allowed to go solo. While the area is a part of the mountain, it is not patrolled by Le Massif’s ski patrol, and it will cost you if you need to be rescued or pulled out, so be sure to use your head. If you stay at Le Ferme, you are within walking distance to the town of Saint Paul where you’ll find plenty of bars and restaurants to unwind. 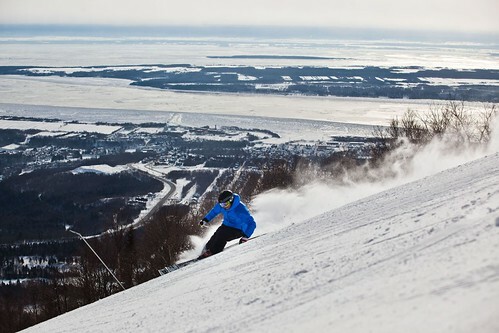 We recommend skiing Mont-Sainte-Anne on day two simply because it is between Le Massif and Quebec City, and it makes sense to get closer to Quebec as the weekend rolls on. Mont-Sainte-Anne is much bigger than Le Massif in terms of skiable acres (526 as compared to 162), so don’t sleep in too late—there’s a lot of mountain to cover. If it’s a powder day, you’ll want to head to the south side of the mountain first and take a few runs at La Crete. While this is not the “best” expert terrain on the mountain, it is the most easily accessible and thus will be the first to be skied out. It also has major views of the St. Lawrence River—a feature that will attract skiers of mixed abilities. Hence, more crowds. After a few runs, head next door and tackle the Black Forest, which houses three runs (two black, one double-black) that all feed down through the glades. La S and La Super S (both double-blacks) are also right there, and you should use the Le Trip lift to access all of the above terrain and pile up the vert as long as the snow holds up. On your final run in this area, head all the way to the bottom and catch the L’etoile Filante gondola up to the top to head over to the north/west side, which is dedicated more toward the backcountry crowd. You don’t want to let it go too long, but fresh tracks will be available longer on this side of the mountain. One local secret is to head to the Natural Zone on the far west side, an area only serviced by a T-bar lift. Because of this, it is less frequented by visitors, and locals know this as the place to go when the rest of the mountain has been skied out. Also on the north side is the “Dragon Zone,” which is where snowboarders and freeskiers will find plenty of freestyle terrain. The lodging at the Chateau Mont-Sainte-Anne is ski-in ski-out and affordable (rates start at $139 for a standard room), so it’s a good option if you want to stay on the mountain and ski the next morning. However, if you don’t plan to ski Mont-Sainte-Anne again, you might want to consider moving on after the ski day and staying in Quebec City. Oddly enough, the Chateau is very strict in its après rules. They don’t let you drink in the hot tub (really, they strictly enforce it, I can tell you first hand) and there’s no nightlife in the immediate area. If you do stay, my recommendation would be to upgrade to a Penthouse Nordic Suite (rates start at $219) where you have a fireplace, loft bedroom, full kitchen and fully furnished living area to entertain in. 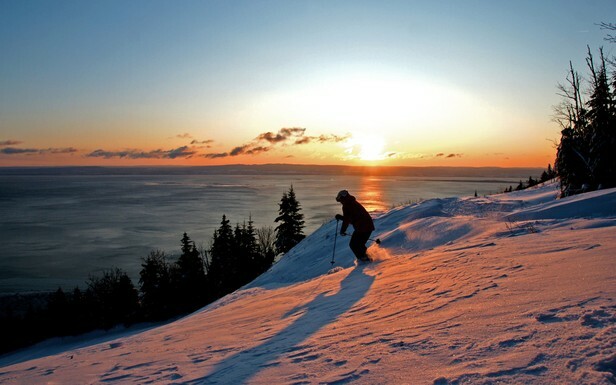 Depending on what you decide about lodging, you can put in a half day at Mont-Sainte-Anne, spend the day exploring Quebec City, or, if you want to get another mountain in, ski Stoneham. It is much smaller than Le Massif and Mont Sainte-Anne with only 1,151 feet of vertical drop, so a half-day is plenty. However, they do have one of the biggest night ski operations in Canada with 19 open trails if you can spend another night in Quebec or catch a late-night flight. Stoneham is only 20 minutes from downtown, so you may want to look into spending a night at Quebec City’s most well-known hotel, the Fairmont Château Frontenac, on either side of your day there. Itineraries always tend to shake out by way of the conditions on the mountain, but be sure to schedule some time in Quebec City, especially Old Town. Then, you’ll experience what makes the area so great for locals—a highly cultural city that sits at the gateway to a beautiful ski region.